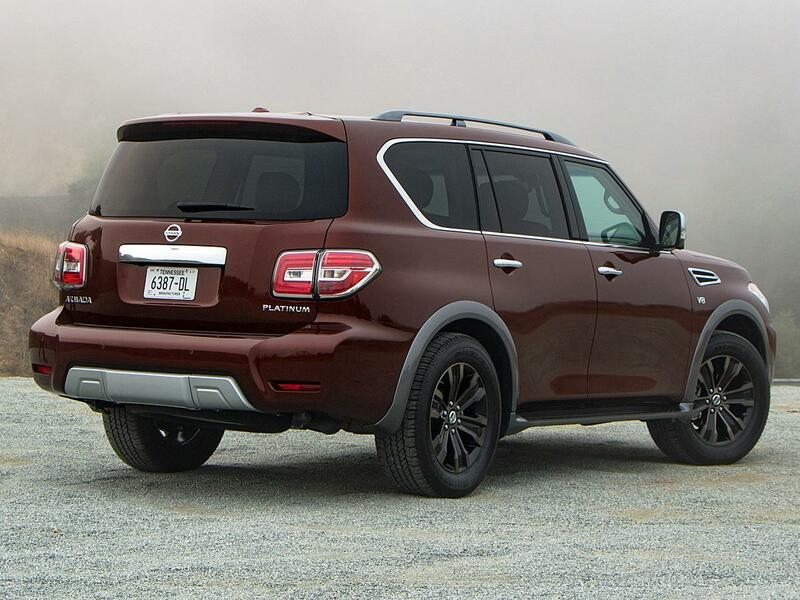 What Nissan would like you to know about the 2017 Armada is that it's an updated version of its Patrol SUV, a model sold in other parts of the world and which has formed the basis for the Infiniti QX80 for several years. A long-running, reliable friend of United Nations officialsstationed in tough spots around the planet, the Patrol enjoys a provenance that Nissan's own Pathfinder could only ever admire, built as it is to handle situations far tougher than a fender bender showdown in the organic supermarket's parking lot. The new 2017 Armada is the quick fix, and it's a hell of a good one, making Nissan's most capable SUV also its best value for money. Plus, you're going to get a palpable upgrade by choosing the Infiniti version over the Nissan. When you buy a Lexus LX, the differences between it and a Land Cruiser are not as clearly cut. A price tag of just over $45,000 cements the new Armada's place as Nissan's mainstream, full-size SUV, clearly leaving the luxury end of the market to the Infiniti QX80. Notably, that base price also undercuts the heavy-hitter in the segment, the underwhelming Chevrolet Tahoe. 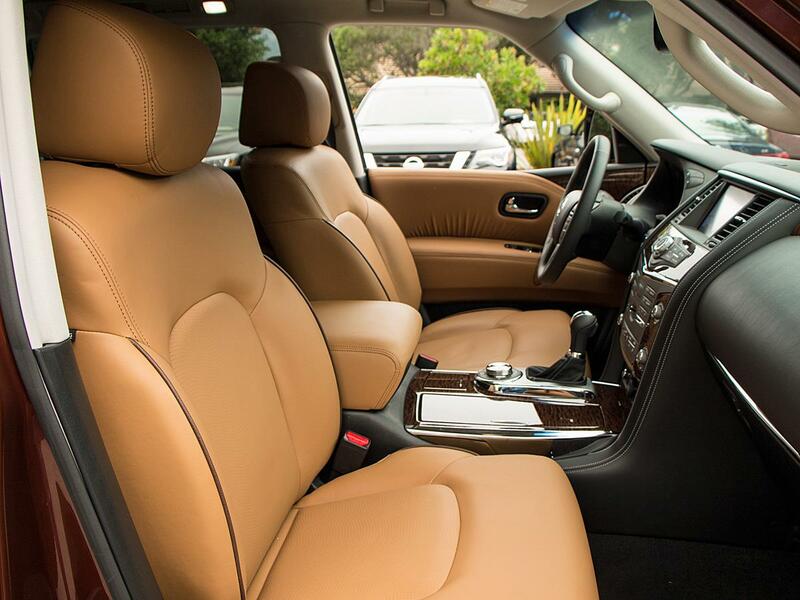 The best way to experience the 2017 Armada's refined feel is to spend any amount of time inside its cabin. Materials appear nicked from a richer parts bin because they were. Soft-touch materials coat the interior, replacing the old Armada's dull, hard plastics and cheap-feeling switchgear. Whereas sitting in the old Armada constantly reminded you of its plebian origins, the surface finishes and attention to detail inside of the new Armada add more than just a touch of class. Reminders that this Armada isn't an entirely new design are plain to see-a waterfall-style center control panel is so 2010-but the overall feeling now is more like a limo than a taxicab. 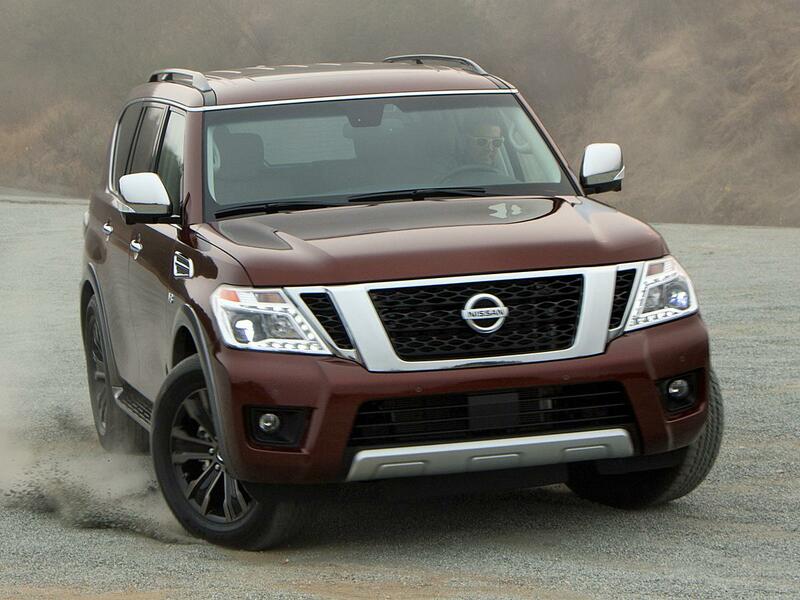 Objectively, fit and finish rank on par with an entry-level QX80. Yes, the Armada still feels enormous inside, because it is enormous. 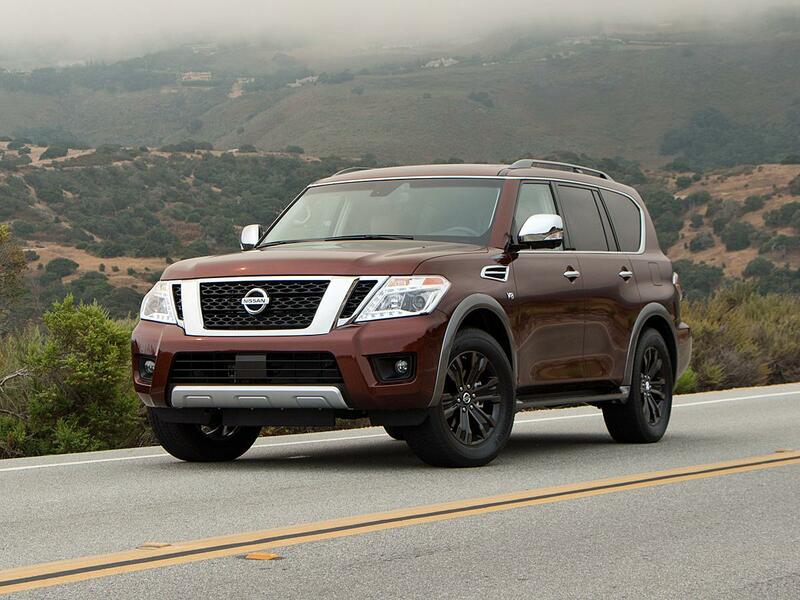 Stepping into the Armada isn't a leap but a climb, assisted by wide running boards. There is plenty of room for up to eight people, and the center console storage bin easily swallows a professional camera or several tablet computers. Optional rear video screens are nestled within gigantic headrests, and a 360-degree around-view monitor makes parking the Armada almost as easy as maneuvering Nissan's tiny Versa Note. While the driver information display and infotainment system could use a hardware update, and though the Armada may not feature colors and materials as posh as those found in the Infiniti QX80, this SUV employs the same underlying design. 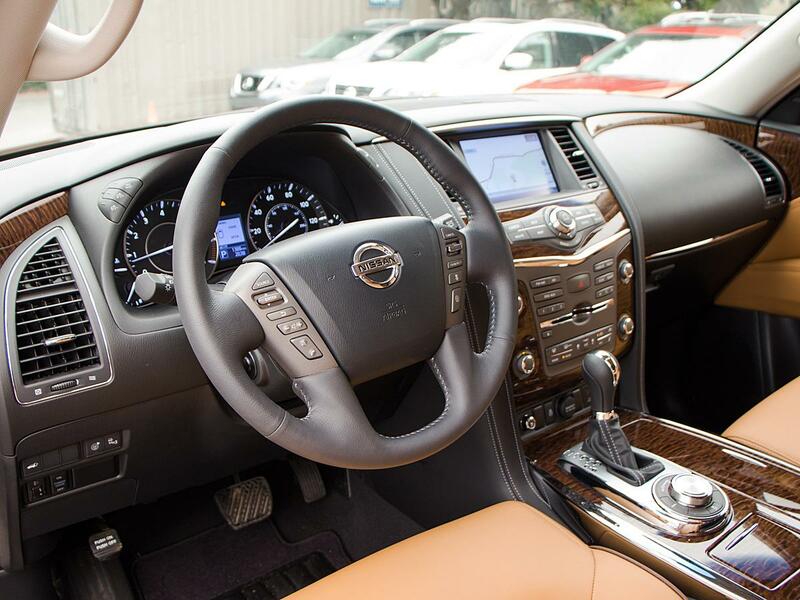 If you like scoring a good deal, the Armada's interior represents the ultimate motorized living room on sale. The 390-horsepower, 5.6-liter V8 is the only engine offered, is paired with a 7-speed automatic transmission, and can tow up to 8,500 pounds of trailer. The power figure represents a healthy advantage over the outgoing Armada, as well as over nearly every challenger in the full-size SUV segment. (Only the GMC Yukon offers an optional, 420-hp V8.) As the Titan XD's excellent diesel engine wouldn't fit under the hood without some remodeling, it won't be offered on the Armada. Want not for that diesel. The gas-fueled V8 is fantastic. Stomp on the gas pedal ? say, to merge onto a highway ? and power flows copiously, producing effortlessly quick acceleration. There is no need for a turbocharger or supercharger here: The Armada's naturally aspirated V8 makes the three-ton SUV act and feel like a sports car. The sound is glorious and hearty, roaring right up to redline before upshifting. Drive it like that, though, and the second-generation Armada won't win any efficiency contests. Nissan estimates a modest improvement in fuel economy over the old Armada, but did not provide final figures. 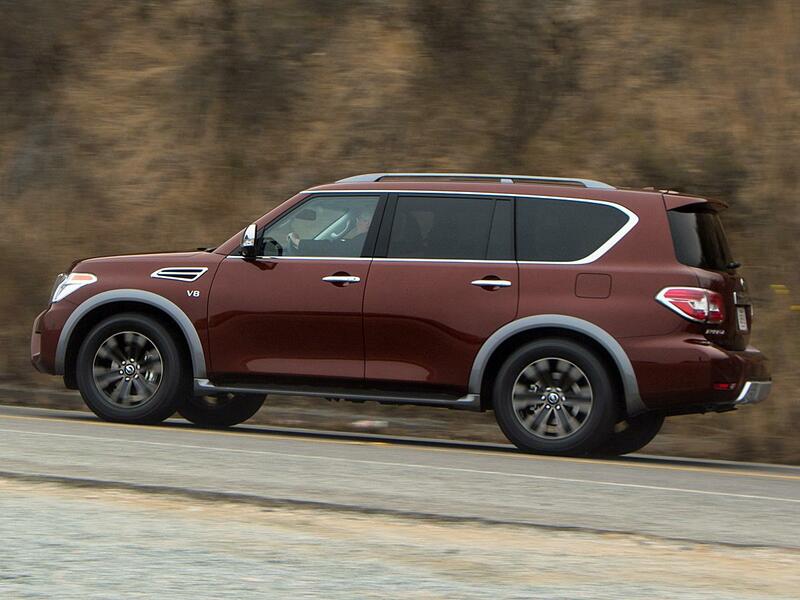 The best the QX80 can do is 16 mpg in combined driving. On a crowded stretch of interstate just south of Monterey, California, I put the Armada to the test, setting the adaptive cruise control to about 70 mph and allowing the blind-spot monitor to chirp if I didn't see a car in an adjacent lane. It performed smoothly and effectively. A turn up a twisty mountain road revealed a flaw in the Armada package: It's not that engaging to drive. Steering feel is almost completely numb, the light steering clearly tuned for easy maneuvering in mall parking lots. From a driver's point of view, pushing the Armada through anything but a straight line is not enjoyable. But then, that's not even close to the point here. Ride quality is commendably smooth, and animpressive amount of sound deadening makes the ride a lot more enjoyable for everyone on board. At just above the speed limit on a fast California freeway, the cabin was whisper-quiet ? even in the third row. I know this because I sat back there, on the kids-only, way-back bench. Despite the Armada's massive size, minimal amounts of leg and knee room mean that the rearmost seats should serve only as short-term perches for adults, similar to the situation in the Chevy Tahoe and GMC Yukon. It's a pity that Nissan couldn't find a way to match the Ford Expedition for third-row seating comfort; even the smaller Honda Pilot supplies more spacious accommodations. Awkwardly, Nissan mounts controls for the power-folding third-row seat at window-switch level in the third row, meaning that kids may try to fold themselves or their siblings into the floor. You'll want them folded, too (the seats, not the kids), because the Armada can either carry extra people or some cargo, but not both at the same time. Behind the third-row seat, just 16.5 cubic feet of load space is available. Given that you'll need to stack things Jenga-style to use all of it, this simply is not practical. With the third-row seat folded, the Armada totes 49.9 cu.-ft. of your belongings, and maximum capacity measures 95.4 cu.-ft. It's also worth mentioning that the Armada proved extremely capable on a short off-road course requiring plenty of suspension and four-wheel-drive system talent. If you're into backwoods driving, searching for trails, or racing up sand dunes, the Armada might be the right rig for you. Though the design is already dated, the "new" Armada nevertheless stands out as a premium product on sale for a song, helping to make it one of the coolest entries in the stale, stagnant full-size SUV segment. Typically, these types of vehicles are big profit drivers for auto manufacturers, based on best-selling pickup trucks and stripped down to the essentials in order to further pad prices with extras. In the face of an Infiniti for Nissan money, the Chevrolet Tahoe and GMC Yukon represent a poor value. The Toyota Sequoia hasn't been seriously updated in a decade. The Ford Expedition, arguably one of the better choices in the segment, is almost irrelevant to shoppers outside of the rental market. Consider it a good thing that Nissan's alternative choice is also a smart one. It probably won't be long before this Armada makes way for one derived from the recently introduced and completely redesigned Titan, returning the SUV to its pickup-derived roots. In the meantime, the dressed down Infiniti QX80 now known as the new 2017 Nissan Armada is a terrific bargain worth seeking out.